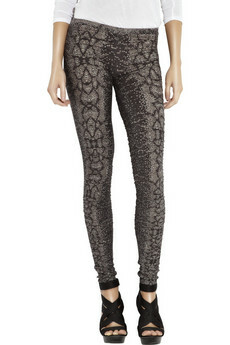 I may or may not be completely obsessed with Sass & Bide's Rats leggings. I have them in black, as you've all seen many times over in my outfit pictures, and now I'm on the hunt for another color. I've been unsure of the metallic ones for awhile, but thankfully they came out with another color: Snakeskin. I kinda like them! A lot! I remember when they first came out and I called them in for a shoot and showed some editors and they all looked at me like I was nuts because off, they look all scrunchy and weird, but on, they are magic.